londonprintstudio is delighted to present the work of Libyan / Canadian artist Arwa Abouon. 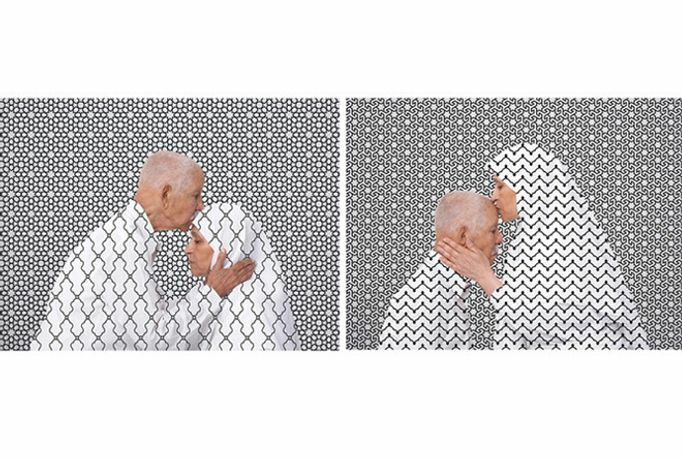 Subtle and approachable, using historical traditions and idioms of her religious background to produce playful and questionable imagery, Birthmark Theory is Arwa Abouon’s first solo UK show. A narrative on identity, duality and spirituality is always present in her work, as are her family members. In return, the work challenges the observer’s pre-set conceptions of the taboos surrounding her identity as a woman and a Muslim. Presenting her work as diptychs, the images read together as one, a metaphor of being between two cultures and finding a balance where duality becomes a blessing, instead of a curse.